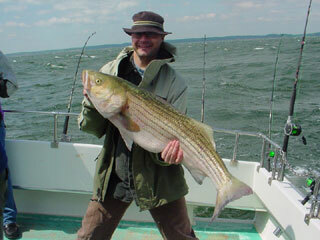 Although the weather was not fit for Man nor beast on April 28, the Otho Williams crew braved the elements to catch a fine limit of stripers to 40 inches. 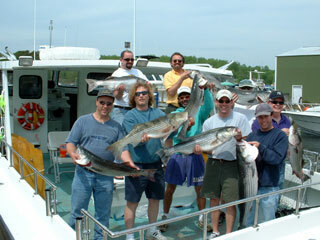 From left to right, that's Chris, Pete, Frank, Otho, Brandon, Frankie, Kathy, and PJ. 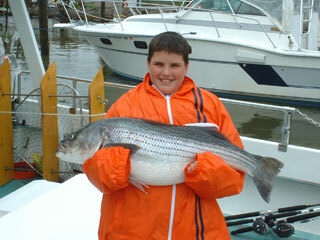 Here is Chris with a 40 inch trophy of nearly 30 pounds! 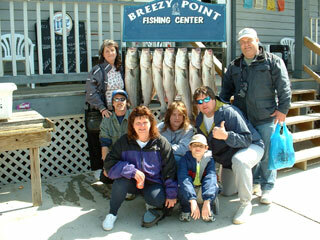 And here's the Will Gustaitus crew of April 27 with their limit catch of rockfish. 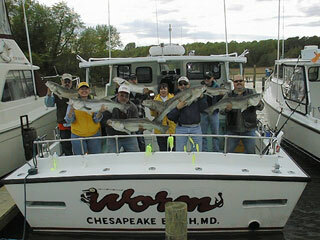 From left to right, that's Pat, Chuck, Sheri, Chuck, Jenny, Will, and Nester. 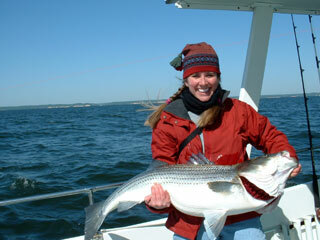 Here's Jenny showing off her citation-sized rockfish. 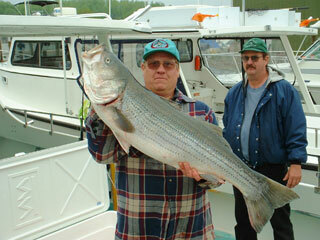 Louie "Big Fish" Hugg was back again for another Bay outing on April 26, when he and his crew caught their limit of rockfish to 40 inches. 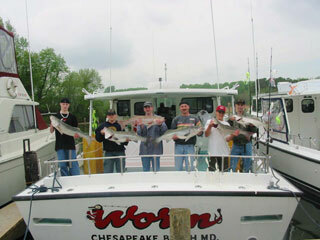 From left to right, that's Louie, John, Jeff, Joe, Bob, Rob, Wayne, and Mike. 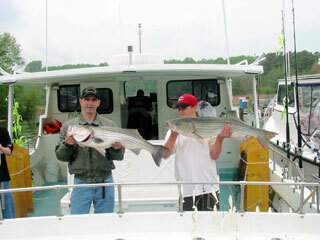 Louie (right) topped the catch again with a 40 inch trophy. 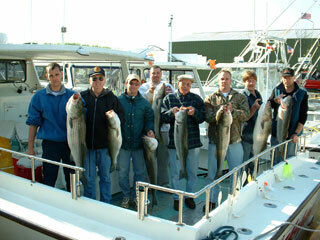 Here's the Buddy Duvall crew from April 25 with a fine catch of large rockfish. 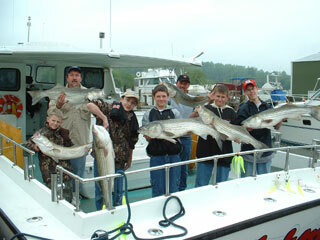 From left to right, that's Travis, Buddy, Billy, Jesse, Hunter, Dane, and Brad. 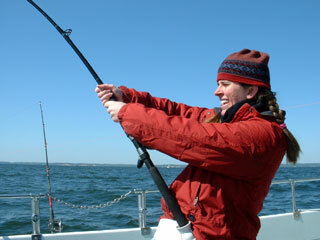 Nice catch guys. 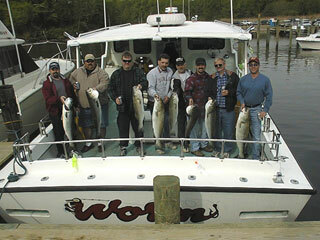 And here we have a crew from Amerawaste Transfer, led by Alan McAllister on April 24, a calm day for a change. From left to right, that's Steve, Brian, Lenny, Alan, Kevin, and John. 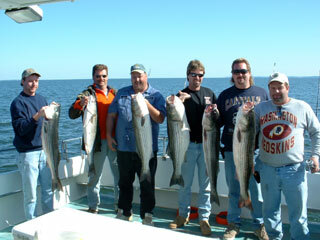 Here's the Mike Savage crew on their first rockfish trip on April 24. 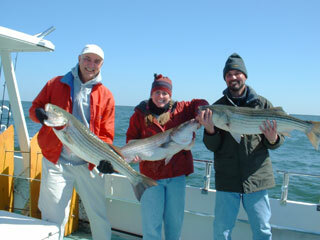 That's Paul, Julie and Mike with their limits of nice stripers. a 42 inch beauty which was released unharmed. 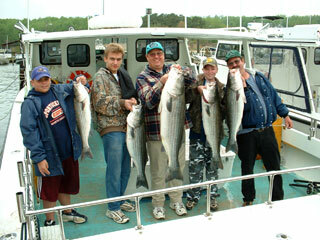 And here we have Fred Gers and crew with a fine limit catch of large rockfish to nearly 40 inches. 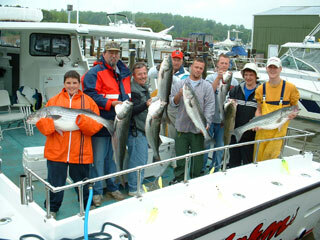 From left to right, that's Hazen, Fred, Captain Drew, Rick, Art, Larry, and Derrick. 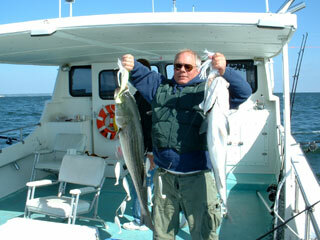 Hazen stole the show early on with a double header of 38 inch beauties. 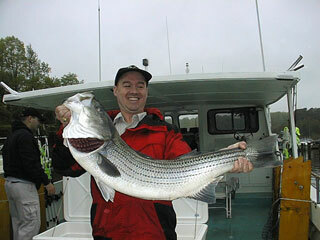 We all thought we had the big one coming to the boat, but such was not the case. 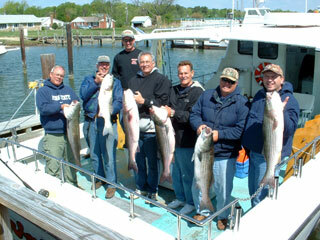 Here's the Ed Pietruszka (far right) crew from April 21, holding a fine limit catch of stripers to 45 inches. 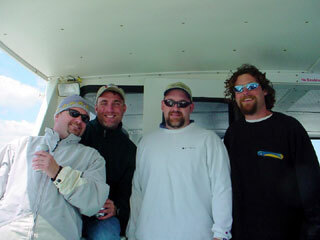 From left to right, that's Greg, Brian, Larry, Jeff, and Ed. 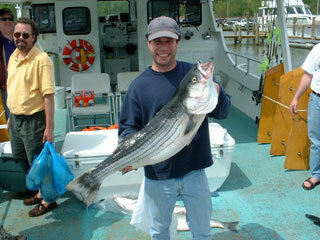 Here's Larry with a 45 inch monster rockfish. 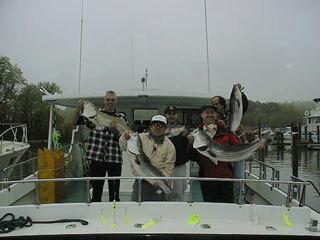 And for our first trip of the season on Opening Day, we hosted Bob Young (yellow shirt) and crew, who caught their limit of stripers to 40 inches. What a way to start off the season! 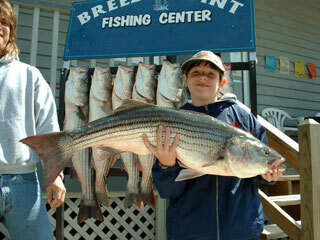 Gabe caught a beautiful 40 inch striper, largest of the day.